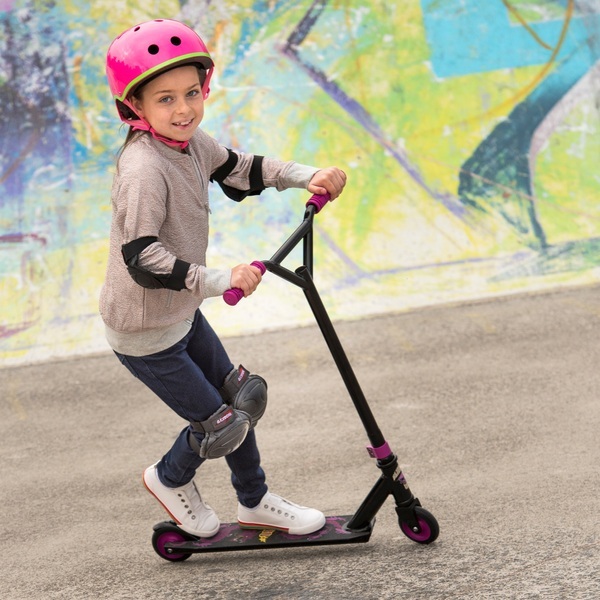 The Blindside 180 Street Scooter is the ideal scooter for young riders. Featuring a deck with cool purple Chinese dragon graphics, the Blindside 180 Street Scooter is an amazing ride. The handlebar grips and wheel trims add bright flashes of purple to the black frame and look great with the graphics on the deck. The 3.5 inch aluminium deck is crafted to ensure that this street scooter gives you the ultimate in strength and durability. The one piece pro style T bar gives you the control you need, as well as looking cool and sleek. The T bar features rubber grips to give the rider a comfortable hold as they scoot. The reinforced steel alloy threaded fork is equipped with an aluminium double clamp. This clamp is designed to improve the stability of the scooter and allow for a safe and steady ride. The steel alloy quick stop brake is an important part of the Blindside 180 Street Scooter’s safety system, designed for your protection. The 100mm PU wheels are enhanced by an alloy core and BEC-5 bearings. Scooters are great for improving motor skills, balance and coordination. They can enhance confidence, as well as being incredible fun. The Blindside 180 Street Scooter is not a stunt scooter. EU Warning: Always wear a helmet, protective pads and correct footwear while riding. Children must be fully supervised by an adult while using this scooter.Do not use on wet or uneven surfaces. Do not ride this scooter on the road.